Girl at War tells the story of Ana, a girl we first meet at the age of ten, as her life becomes unrecognisable in the face of civil war. A previously happy, carefree existence, roaming the streets of Zagreb with her best friend Luka, and going home to her parents and baby sister, is forever changed as air raid drills become the norm. The novel follows her as she traverses this new life, eventually ending up in America, before returning to Croatia to try and find out where she belongs. I can’t say that I would necessarily have picked this book up had it not been offered to me for review. I can find myself stuck in a bit of a reading rut sometimes, and reading about the war-torn Balkans wouldn’t necessarily appeal. But the most wonderful thing about being a book blogger is that you are often forced out of that rut, and find yourself reading the most wonderful and powerful stories. That has never been more true than with Girl at War. I positively devoured this book, reading it in one morning, reluctant to put it down before I found out what would become of Ana. Separated into two parts, we first meet Ana as a normal young girl; her family might not be well off, but they are happy. She notices the glances between the adults when the issue of Serbs and Croatians is mentioned, but at first these things don’t seriously worry her. She’s happy to use the sandbags to play on with her classmates, and fight over who gets to ride the generator bike in the air raid shelter. The swiftness with which Ana loses her innocence is shocking and brutal, and the climax of the first half of the novel is horrifying. We pick up with her ten years later, when she is studying in New York and trying to hide her past from those around her, and to a certain extent, from herself. 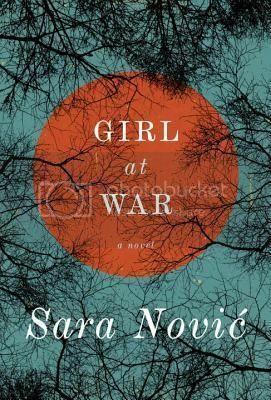 Throughout the second half of the novel, as she realises that she has to return to Zagreb, we learn more about her journey, and as she comes to terms with her past, and her identity, Sara Nović takes us along for the ride. I wrote recently about learning through fiction, and that is the case here. While the genocide in the Balkans happened within my lifetime, I know very little about it. I’m the same age as Ana, and while she’s a fictional character; I have no doubt that her story is one that is very much rooted in truth. In 1991, as nine-year-old girls, mine and Ana’s stories could not have been more different. Books like Girl at War, beautifully written and with a historical story that is still very much within living memory, are so important, and I’m so very glad that I have had the opportunity to read it. A wonderful debut from an author whose future work I will most certainly be seeking out. I agree, I wouldn’t have read this had I not been offered a review copy, but I loved it, really loved it. Found gaping holes in my historical knowledge though! Definitely an author I’ll look out for again.